I know it's been a bit, but I want to show off my latest work for the Ravelry September-October Designer's Challenge. It worked out well, given that I had plans to make a hat for my Roommate, anyway. I didn't get it finished before the October 31rst deadline (today), but I'm still pretty happy with it. It's not my best photography, since it's a WIP, but I hope it gives a nice teaser! 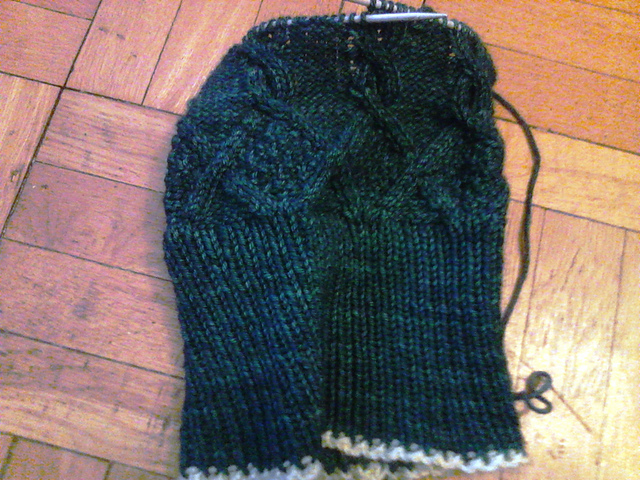 The provisional cast-on at the bottom is setup for a knit lining. I'm actually planning to make this hat reversible -- both sides will be the same, just in different colours. I'm actually really excited about this. It's my first major experiment in making charts, too, which has been really fun (if occasionally temper-inducing!). And because it's worsted/aran weight, it knits up pretty quickly (when I'm not ignoring it in favour of other projects, sadly).